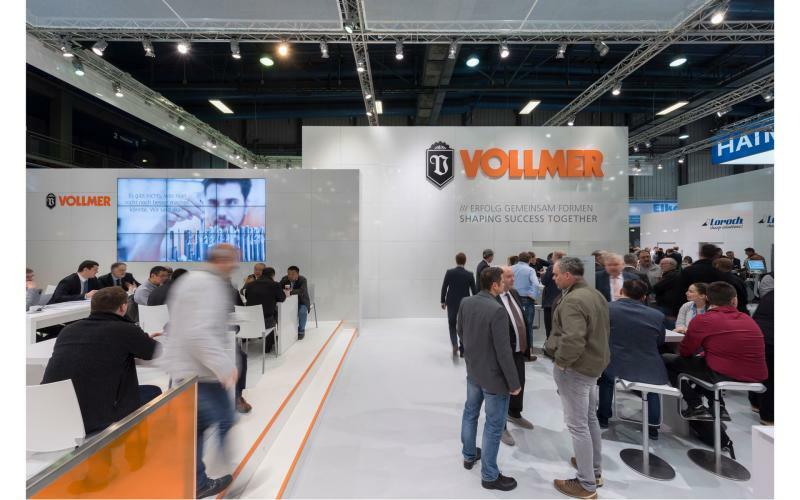 Under the motto "Shaping Success Together", the sharpening specialist VOLLMER presents its product and service portfolio at this year's trade fair for the forest and wood industry Ligna. At stand B60 in Hall 27, the Swabian company showcases its grinding and eroding machines for the wood processing industry, designed for sharpen circular saws as well as rotary tools. The focus is on the digital networking of man and machine in production. Here VOLLMER presents its digital initiative V@dison, which gives tool manufacturers a gradual and feasible entry to the topics IoT and Industry 4.0. From 27 to 31 May 2019, trade fair visitors can see the erosion machine VPulse 500 for PCD-tipped rotary tools, as well as the grinding machine VGrind 360 for carbide tools, live in action. VOLLMER sets new standards at Ligna with the performance package for the QXD 250 erosion machine, which offers a significant increase in efficiency of the machine can be achieved. At Ligna 2019, the trade fair for the forest and wood industry, VOLLMER showcases efficient complete solutions for sharpening circular saws and rotary tools for the wood industry at Stand B60 in Hall 27. The focus is on the new digital initiative V@dison from VOLLMER, with which the machine builder integrates its grinding and erosion machines in an IoT environment (Internet of Things) in order to support tool manufacturers with the implementation of Industry 4.0 projects. For this, VOLLMER developed the IoT gateway, which makes it possible to exchange data between sharpening machines and different IoT platforms. The IoT gateway is based on open source standards and its services are platform-independent in order to visualise and process data of VOLLMER machines and third-party providers. Diamond-tipped tools – those that feature polycrystalline diamond (PCD) – are vitally important in the production of wood and composite materials. The QXD 250 disc erosion machine from VOLLMER is on show at Ligna. Thanks to a modified generator and extended programme functions, it is more efficient and faster in the machining. With the pallet conveyor magazines HC 5 and HC 11, the machine can be extended by up to 28 or 64 workpiece places. With the QXD 250 VOLLMER also worked on process optimisation: The company now offers a new performance package consisting of software and hardware, with which the machine performance can be improved significantly in terms of efficiency. This is achieved with seamless interaction of generator technology, process parameters, gap analysis, as well as drive technology. The performance package is one of the first products of the new digital initiative V@dison from VOLLMER. VOLLMER also offers wire erosion machines for machining PCD tools. At Ligna the company presents the VPulse 500 wire erosion machine. With its eroding generator and advanced technology, it can manufacture high-quality PCD tools in large volumes. Modern machine kinematics ensure high profile accuracy in both production and maintenance. With the VPulse 500 operating concept, the touchscreen allows you to easily programme and control the tool for quick, error-free work. The VGrind 360 grinding machine is also on board from 27 to 31 May 2019 in Hanover. It is ideal for machining carbide tools such as drills and milling cutters, which are also used in timber construction and furniture making. Thanks to two vertically positioned spindles, the VGrind 360 machines and finishes rotary tools in large quantities quickly and precisely. With the VGrind 360, VOLLMER provides tool manufacturers with a solution for rotary workpieces of varying geometries. The CP 650 sharpening machine is one of the other technology highlights. It is suitable for sharpening tooth faces and tooth tops on carbide-tipped circular saw blades between 80 and 650 millimetres in diameter. What's more, VOLLMER will be available to provide information about the new CHX 840 and the CHF 270 which can be used for sharpening services or in filing rooms at sawmills – simply pay them a visit at their Ligna stand. "We use Ligna for the in-depth exchange of information and ideas with customers and partners in the wood industry", says Dr. Stefan Brand, CEO of the VOLLMER Group. "Apart from efficiency, precision and customisation, the topic of digitisation plays an important role this year. Our sharpening machines and services are adapted to Industry 4.0 and IoT, thus providing more quality for circular saws and rotary tools."